What a pleasure to be able to create an opportunity to help launch this new song with my fellow speakers at the PSA Holland convention. I have known Pastor Rauna for about 10 or more years... and she has always been a person who looked for practical ways of sharing God's love. I told her to send this along and that I would share it with my friends... if you are in the US she might be able to get you a tax deduction as well. Here's the info on Chile that I promised you. I am attaching a few pictures to use or not use as you so desire. These pictures are right in the area where I am going. Bob what ever assistance your friends can bring will be greatly appreciated. In one of the pictures you see them collecting water. One of the major items we are purchasing is bottled water. We are still needing about $20,000 US to purchase supplies of water, vitamins, medicine, food supplies (meal bars etc). We are purchasing these in Mendoza Chile and trucking them in to Concepcion, Chile. The trucking will cost about 3 - 5 thousand dollars depending on how many trucks we fill. These supplies are calculated to be sufficient for about a month for a camp of about 5,000 people displaced by the earthquake. These people lost everything, housing, clothing etc. We have chosen this location as I personally know the people looking after this camp and they are extremely reliable. I know the supplies will all go where they are meant to be used and won't be sold or misused. I will also personally be in Chile for almost 2 weeks making sure things are properly distributed. A pastor friend of mine in Argentina has his church collecting, blankets, clothing, shoes etc. They are in Spring heading toward winter and it is getting quite cold to be without shelter all night. Even now, a month after the original quake of 8.8 they are still having very strong after shocks. 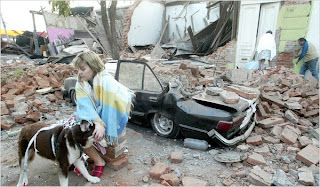 A friend of mine, there in Concepcion, has said that the aftershocks are still so strong that in some areas it has been too dangerous to even start looking through the rubble for bodies. Thanks so much Bob for any assistance you can drum up.